Midnight Releasing has announced the October 11th Cable VOD, Digital HD and DVD release of She Who Must Burn, Canadian cinema provocateur Larry Kent's latest feature. Kent and co-writer Shane Twerdun have crafted a thought-provoking and violent horror story centered around the all-too-real battle between personal choice, state-sanctioned law and religious dogma. She Who Must Burn will be available to rent or own starting October 11th on Dish Network, Cox, Charter, Verizon Fios, DirecTV, iTunes, Amazon Instant, Google Play, Vudu, XBox and more. Sarah Smyth ("Cedar Cove", 50/50, "Supernatural") headlines as a healthcare provider at odds with the evangelical family in her small town. When she refuses to stop seeing women in need and even helps a desperate member of their own family (sci-fi icon Jewel Staite, "Firefly", "Stargate: Atlantis", "The LA Complex"), they decide she is to blame for the mysterious deaths in the community and must pay. She Who Must Burn has been acclaimed by mainstream and horror media since its world premiere at the 2015 Fantasia International Film Festival, where the film took home the award for Best Feature Film. It went on to screen around the world, winning Best Feature Film at Blood in the Snow and sweeping the awards at the Fright Night Festival, taking home Scariest Film, Best Villain and Best Supporting Actress. Modern Horrors raved that "the horror is all in the reality"and FilmFestivals.com declared She Who Must Burn is "a profound, thought-provoking movie that brilliantly speaks about our flawed human nature". A deadly storm heads towards a small mining village as the local preacher feeds the dark resentments seething in the souls of its citizens. Angela is the only medical resource for women in this unfortunate town where stillbirths and cancer have become disturbingly common. The local preacher and his followers blame Angela for the miscarriages and deaths, and even her Deputy Sheriff boyfriend can't protect her from their wrath. Dark clouds gather as the preacher's followers, infected with religious fervor and inflamed with passionate righteousness, seek to cleanse their community. Those who sin against the Lord must pay. 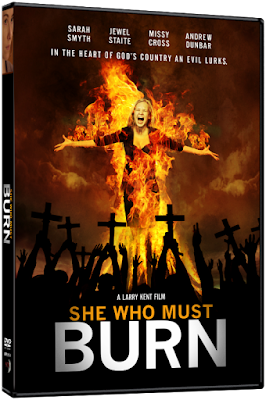 The DVD release of She Who Must Burn (SRP $17.98) will be available exclusively from Amazon.com. U.K. viewers can view the film at Amazon.co.uk via the link below.